Error handling is crucial for any application. In Line-of-Business (LOB) ASP.NET applications, error handling can be implemented in multiple ways. Generally, when an application needs to perform data validations on data submitted by end-users, we implement data validations using annotations which is also known as Model validation. Model validation is limited with the Model class (aka entity class), but our application must be capable to validate code while executing - this is known as exception handling. Traditionally, most of the programming languages provide try…catch…finally block for exception handling. There is nothing wrong in having a try…catch…finally block for every method in each class of the application, but it is always better to implement a global error or exception handler. By having a centralized exception handling, we can make our code more readable and maintainable. In ASP.NET MVC applications we have exception action filters. Using this action filter, it is easier for the developer to implement global exception handler. 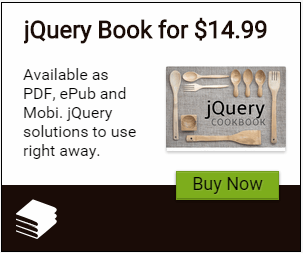 I have already posted on MVC Exception Handling at this link. In the current article we will implement error handling in ASP.NET Core applications for WEB API. It is important to to have a global exception handler in WEB API so that the API action methods can remain clean, readable and maintainable. 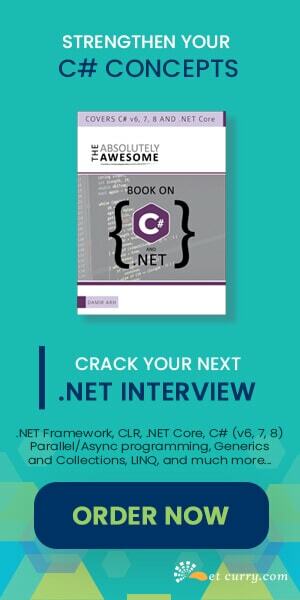 ASP.NET Core provides a built-In middleware for global error handling, but we can also implement custom middleware or even we can write try...catch block for each action method. We will implement error handling with all these methods. Middlewares are software code, that are used to configure additional features for the HTTP Request Pipeline. These Middlewares are configured using IApplicationBuilder interface. Middleware uses RequestDelegate to handle Http Request under the current request HttpContext. In the Http pipeline there can be multiple Middlewares, the RequestDelegate for each component is responsible to for invoking next Middleware component in pipeline. 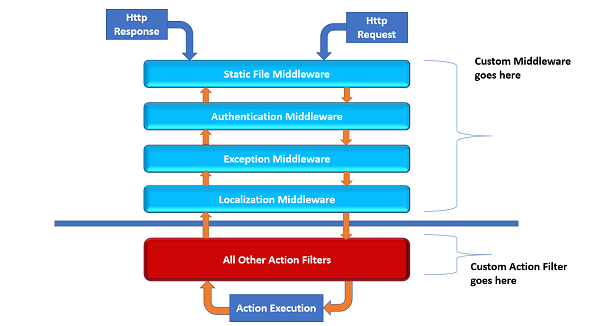 There are Middlewares for Static Files, Authorization, Sessions, etc. In ASP.NET Core, the Middlewares are configured in the Configure() method of the StartUp class. The following application is implemented using Visual Studio 2017 and .NET Core 2.2. Step 1: Open Visual Studio 2017 and create a new ASP.NET Core Web Application. Name this application as Core_ErrorHandler. In the Models folder, add a new class file of name Employee.cs. This file contains Employee class as shown in the following code. Step 2: Since the application uses EntityFramework Core, add NuGet packages in the application as shown in Figure 2. Build the application and make sure that it is error free. Step 4: To generate Sql Server database, we need to run database migration commands. To do so, open the .NET Command prompt and navigate to the project application folder and run commands as shown in Figure 3 (red marked commands). The above class uses AppDbContext class to perform Read/Write operation on Employees table of MyAppDb Database. 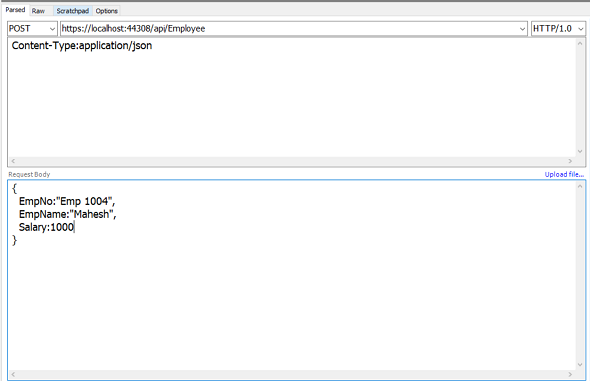 Step 7: In the Controllers folder, add a new Empty WEB API and name it as Employee Controller. The above code contains the Get() and Post() methods. The Post() method validates the Employee model using ModelState property. 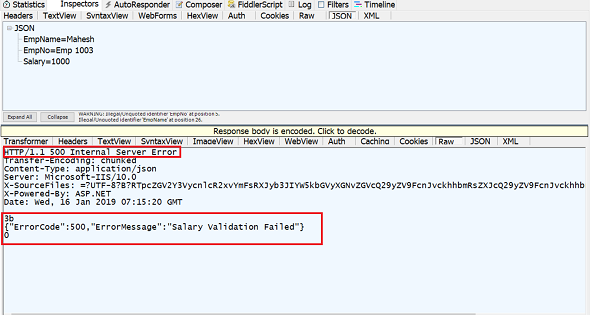 This method validates the Salary values posted, if it is less than 2000, then the “Salary Validation Failed” exception is thrown, this exception is caught by catch block and the method returns Http status code as 500 and the exception message. We can test execution using Fiddler or Postman. I have used fiddler here. Execute this request, the WEB API will return the exception as shown in Figure 5. The WEB API returns HTTP error status code 500 which means an Internal Server Error. 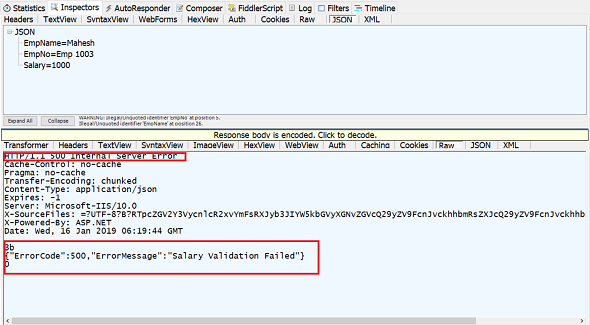 This also shows the raised exception message in the WEB API method as Salary Validation Failed. Adding try…catch block in the action method makes sure that the method will execute the business logic correctly. A challenge in this approach is that the developer must add try…catch block to each method. This may increase the development and maintenance cost. We must find a way out to handle errors globally to increase maintainability of the code. This is where the ASP.NET Core middleware comes into picture. The ASP.NET Core pipeline is configured by IApplicationBuilder interface. This interface provides several middleware methods. These middleware methods will be added in the request pipeline to manage the request processing. One of the inbuilt middleware method is UseExceptionHandler(). This method will catch exceptions while request processing. // 1. 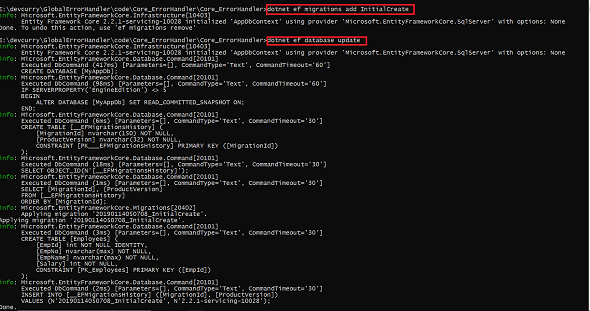 Invoke UserExceptionHandler() method and pass IApplicationBuilder to it. The above code has the following specifications. The ErrorClass class contains ErrorCode and ErrorMessage properties. The UseExceptionHandler() method accepts the Action Delegate of type IApplicationBuilder. This is used to invoke Run() method. The Run() method accepts the RequestDelegate object. This object is used to handle process current Http request that provides HttpContext object. This step listen to the Http Status code for the Response from the current Http Request and also set the response message content type. This step is used to receive the exception message generated while processing request. The Features property is the FeatureCollection object of the HttpContext class. This is a collection of features provided by the Http Server and Middleware. These features may be the exceptions generated while processing request. The IExceptionHandlerFeature interface represents an exception handler with the Http Request. This is used to read exception message thrown by the server while processing request. This step creates a Http Response message. This step write the Http Response. This shows the error message thrown by the exception while executing the Http Request. The best part of using ASP.NET Core is that, it allows developers to define extensions for Middlewares that provides a great control over the application and makes it maintainable. In this step we will implement a custom middleware to develop a global error handler. As discussed above, in ASP.NET Core, the RequestDelegate object processes Http Request, which means that it holds and monitors the current Http Context. When the WEB API is requested, the RequestDelegate will listen to any error that is thrown while processing the request over the current HttpContext. When we create a custom middleware class, we need to inject RequestDelegate in its constructor. This class must have InvokeAsync() method. This method accepts HttpContext object and the method body uses try..catch block. If an error occurs, the catch block will handle the error and generate the error response. In the following steps, we will implement code for custom middleware for error handling. Step 12: In the project add a new folder and name it as ErrorMiddleware. In this folder add a new class file and name it as ErrorMiddleware.cs. Add the following code in this class file. /// We need to inject the "RequestDelegate" class. /// We need to add the InvokeAsync() method. The ErrorMiddleware class is injected with RequestDelegate object. The HandleErrorAsync() method accepts HttpContext and Exception objects as input parameter. This method is responsible for generating error response for current Http request along with the Exception raised during processing current Http request. The InvokeAsync() method accepts HttpContext object, this is a standard method of Custom Middleware, this method is used to process Http request. If an exception is thrown while processing the Http request, this method will catch it. In the catch block, the InvokeAsync() method calls HandleErrorAsync() method. This method is used to write the error response for the current Http request. The CustomErrorExtensionsMiddleware class contains CustomExceptionHandlerMiddleware() extension method for the IApplicationBuilder. This method registers our ErrorMiddleware class in the application request pipeline using UseMiddleware() method of the IApplicationBuilder interface. Run the application and test it in fiddler, the result will be as shown in Figure 7. Pass the data as shown in Figure 7. Execute the request, it will display the following result. Conclusion: It is a good practice to have a Global Error handler in ASP.NET Core applications. This will make our code clean, readable and maintainable. The advantage it offers is to have a central control on our application by defining a custom middleware.